A rusty fishing trawler that left Malta packed with food and medical equipment has managed to dock in Misurata, bringing one of the first aid shipments to Libya’s besieged third city since it came under fierce attack by Muammar Gaddafi’s forces 10 days ago. The shipment arrived this week from Malta carrying 150 tons of much-needed aid provided by Libyan diaspora groups and humanitarian agencies including Germany’s Medeor and Solidarity Overseas Service (SOS) Malta. “We feel that if aid can get to the people, we must get it to the people as quickly as possible,” said Claudia Taylor-East, head of SOS Malta, before the boat left Malta. The shipment docked in Misurata, 214 kilometres east of Tripoli, on Wednesday after a 19-hour journey across the sea. It was able to pass into the Gasr Ahmed port despite rocket fire only the night before which damaged parts of the terminal, port staff said. Air strikes by international forces earlier in the week sank a Libyan navy vessel. “Misurata is now surrounded on three sides,” said Tariq, 40, the chief engineer on the boat, which usually fishes for tuna in the Mediterranean. “You can only have access to the outside from the city by sea. In Misurata, this is the only ship that has international papers,” he said. This is the second successful trip by the boat, a third had to turn back after the port was blocked by Libyan military vessels. Four boats laden with arms and fighters have also arrived from the eastern city of Benghazi. There have also been humanitarian shipments from Turkey, which have brought back dozens of people wounded in a conflict in the city which the opposition says has killed around 200 people so far for sure and perhaps many more. The boat that arrived on Wednesday carried food including flour, pasta, canned vegetables and sugar, as well as two intensive care units and medicine. The aid could not come soon enough for the main clinic in Misurata which has been struggling to deal with an overflow of shrapnel and gunshot injuries. “We have a shortage of staff, medication and equipment,” Ali El Misrati, a 27-year-old junior doctor who has lost three cousins to the conflict, told AFP as he bandaged the right leg of a patient wounded by shrapnel. “Forty people have come in so far today. It’s quiet,” he said. “We need plastic surgeons and orthopaedic surgeons. We need another hospital! We only have three operating theatres here,” he said. The nurses are mostly medical students since many of the clinic’s usual staff have run away. Dr Ramadan, a cardio-thoracic surgeon, arrived to help at the clinic on the same boat that brought the aid. “The doctors are doing their best with very limited resources. Many people will be lost who should not be,” he said. Doctors say between 50 and 70 patients are brought in every day. Three out of four are civilians and between five and 15 a day die in the hospital. “Ten days ago they brought in an eight-month-old baby with gunshot wounds. We are all men here but we couldn’t stop crying,” said Hakim Zaggut, 38, a dentist who has been performing many surgeries because of a lack of staff. “Who shoots an eight-month old baby? These are animals,” he said. Two young boys lay in bandages in one ward after being hit by a mortar round and one man was in a coma with a gunshot wound to the head. On Tuesday, a medic said the death toll was rising quickly in Misurata – with 142 people killed in just 10 days – as Gaddafi forces continue to shell the town prompting warnings of a massacre from rebel spokesmen who appealed for air strikes. A rebel spokesman said 20 people were killed on Wednesday by Gaddafi forces deployed in the city’s main avenue and snipers perched on rooftops, adding “only three of the dead were rebels, the rest were civilians”. Western coalition forces launch-ed a campaign on March 19 to enforce a UN no-fly zone in Libya and to protect civilians under attack and pounded Gaddafi forces in and around the rebel stronghold. 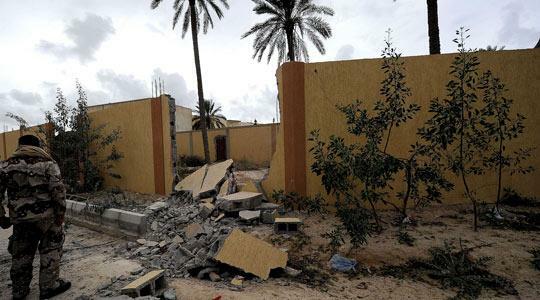 Defence officials in London said yesterday that British warplanes had bombed Libyan tanks, armoured vehicles and a surface-to-air missile site around Misurata. RAF Tornado aircraft flying from the Italian base of Gioia del Colle carried out the strikes Wednesday around the rebel-held city as part of a multi-national operation to protect civilians, the Ministry of Defence announced. The Libyan Foreign Ministry said on Monday that its troops completed an offensive against Misurata and that “calm” reigned once again in the strategic city.